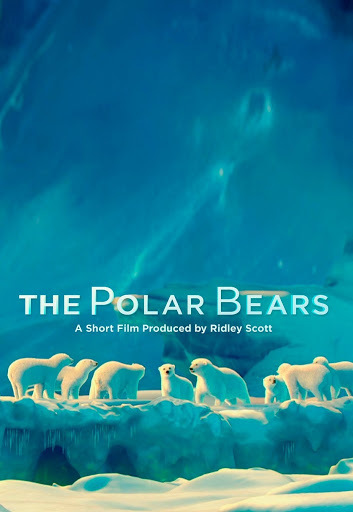 The Polar Bears is a 2012 3D computer animated short film presented by The Coca-Cola Company, produced by Ridley Scott, written by David Reynolds, and directed by John Stevenson. The film is based on Coca-Cola’s iconic polar bears and was released on the company’s website and YouTube channel on December 31, 2012. Kaskae leads his family of polar bears across the Arctic Circle to give a speech to other polar bears. Jak, the troublemaker in the family, is given the task of looking after his little sister Kaia along with his elder brother Zook. Hearing part of Kaskae’s speech about reaching new heights, Jak rushes to the peak of the tundra with Zook trailing him. As soon as both brothers reach the top, Jak shoves Zook before they both slide down and crash their father’s speech. The family then discovers an unattended Kaia dancing with a flock of puffins. The other polar bears are not amused by the scene, as their kind are not supposed to socialize with the puffins, but Jak jumps in the water to join in the fun. Kaskae then orders everyone to be silent before he and the rest of the family jump in to play in the water.